Gardening is a wonderful activity for kids to be involved in. It is full of sensory experiences, from the feel of the dirt to the colors and scents of the growing plants. Taking care of plants, like in a mini garden, teaches kids responsibility as well as teaching them about how plants grow. But when it comes to growing plants, kids can get impatient. 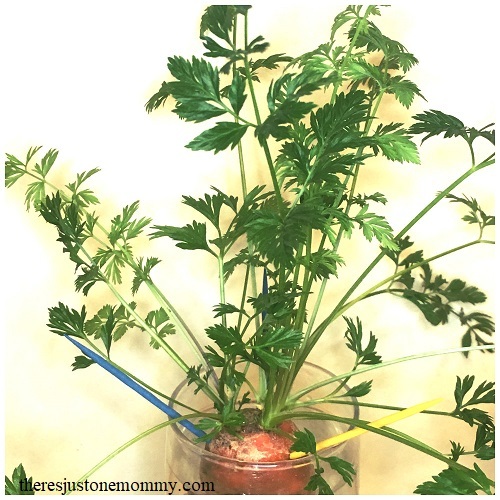 Growing carrot tops is an easy and fun kids gardening activity that is perfect because it only takes days to see results. Carrot tops aren’t just an easy plant for young gardeners to grow, their fern-like foliage looks pretty growing in a sunny window. Growing a carrot top is super simple. Stick 3-4 toothpicks around the top of the carrot, just at a slight angle. Use the toothpicks to support the carrot at the top of a clear glass or small jar. 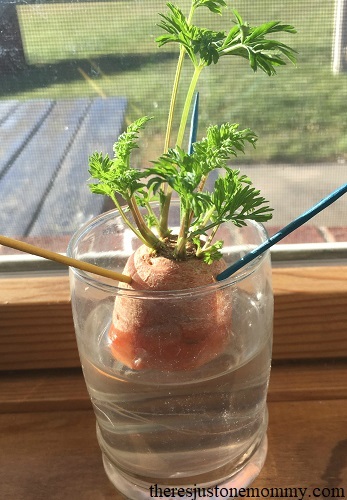 Fill the glass with water so the bottom of the carrot is resting in the water and place it in a sunny window. The kids will be amazed that in just 2-3 days you will see a small bit of green sprouting from the top. If your kids are anything like mine they will be excited to check their carrot each day. Older kids can use a ruler to take measurements and even make a chart to show how much it grows each day. 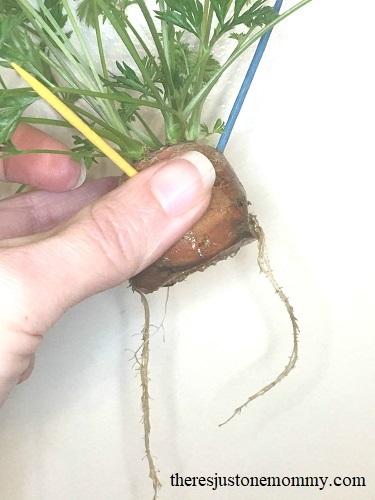 Not only do carrot tops make a fun plant for kids to grow, but they provide an opportunity for kids to explore plant roots. After all, a carrot is actually an edible taproot. That is, it’s the main root that grows straight into the ground. As your carrot start to grow, your child will notice smaller roots growing off of the section of taproot. These smaller roots help bring water into the plant. Your carrot top will continue to grow as long as you keep it in water. It makes a beautiful touch of green during the winter and early spring months. You can even take your child’s gardening experience further and plant the carrot top in a small flower pot with soil. While it won’t form a new carrot, the greenery may flower and produce seeds, which you can harvest and plant. 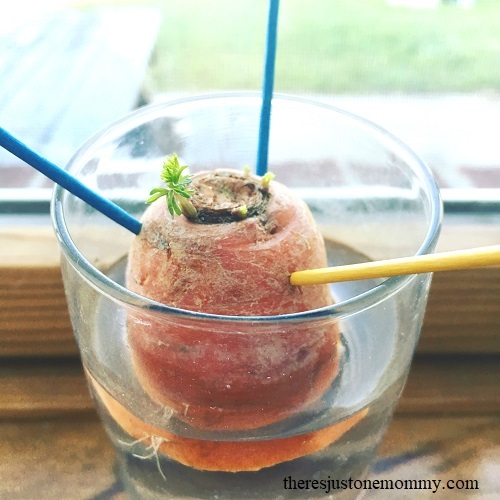 Who knew that a simple kids gardening activity like growing carrot tops could be so fun? Get more fun ideas like this delivered to your email twice a month by subscribing to our newsletter.